EasyJet, the low-cost airline that has traditionally focused on price-led marketing, is launching a £50m pan-European brand campaign to reposition itself as a carrier that connects people. The campaign, created by VCCP, breaks on 1 October and features a TV ad supported by print and digital activity. It uses the strapline, "Where are you going? ", and will run across easyJet’s key European markets – the UK, France, Spain, Italy, Switzerland, and Germany. The TV ad will feature images uploaded by easyJet staff, which show special moments from their holidays, to easyjet.com. Consumers will be encouraged to upload their own pictures once the TV ad launches. Previous marketing activity for the brand has been tactical and price-driven, created in-house and often competing directly with no-frills rival Ryanair, alongside recent brand work created by Publicis London. Past creative has also addressed consumers directly regarding aviation issues, including its opposition to Air Passenger Duty (APD) in the 'Tax planes not people' campaign. In May, easyJet reported a 94% rise in pre-tax losses to £153m for its first six months, blaming higher passenger taxes and oil prices. 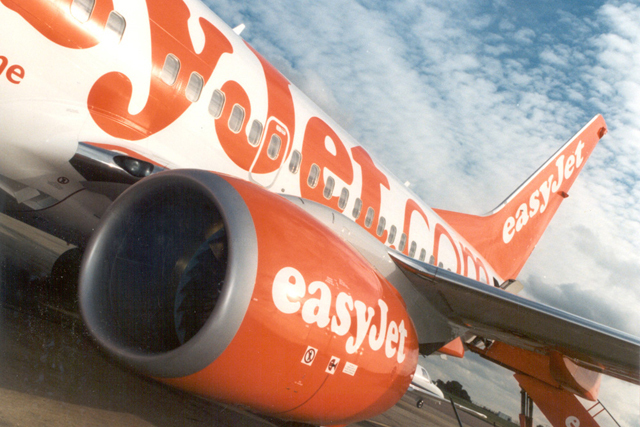 In October 2010, easyJet and its founder, Sir Stelios Haji-Ioannou, finally came to an agreement over the long-running "easy" brand name dispute, which resulted in the airline paying an annual royalty of 0.25% of its total revenue.